App Developer Salary: How Much Can Android & iOS Developers Make? Today, the job market is full of various different jobs that offer great working conditions and an amazing salary. This is especially true when it comes to the field of IT – there’s a wide variety of choices starting from simple programming all the way up to web or game development. One of the most commonly discussed job positions that apparently offer great salaries is the mobile application developer’s position. And in this article, we are going to try and see whether or not the mobile app developer salary is as good as people claim it to be. First of all, we’re going to talk about the app developer’s profession – what it is, what these people do and all of that good stuff. I won’t go too in-depth, but you will still be able to get a general idea before moving on. After that, we’ll talk about the three main types of app developers out there, and then move on to discussing the actual application developer salary. 3 App Developer Salary – How Much Do They Get Paid? We can’t really start talking about the app developer salary before we lay some ground rules for what an ‘app developer’ actually is, now can we? Just to make sure that we’re both on the same page, let’s briefly go over the typical app developer’s responsibilities and duties. After that, you’ll be able to better understand what is typically required out of an app developer. In its most general form, app development deals with mobile app creation and further, well… Development. However, app developers deal with so much more than just the actual coding processes themselves. First of all, a good app developer has to understand the market – how it works, what are the current trends, what would be the best plan of action, etc. This means that it isn’t enough to only know programming – you must be knowledgeable in the field of marketing, too. Furthermore, app developers have to possess great team working skills. Since they will most likely be working in a company, most of the processes that other employees are responsible for revolving around the app itself. This means that if there are any additions, corrections or general maintenance needed, everyone has to talk to the app developer. Now that you have a very general idea about app development and all of the processes surrounding it, let’s move on and talk about the different groups of app developers out there. After that’s done, we’ll move on to the actual app developer salary. Imagine this situation: you like to writing, so you spend your time researching different writing techniques, applying them in your own work, perhaps you’ve even taken some online courses that teach you how to become a better writer. One day you notice that there’s a job opening in a small company – they’re looking for someone who would manage their blog. You decide to try and apply for the job, since they don’t require any prior experience in the field – only a strong passion and motivation to learn something new. Eventually, one thing leads to another and you end up getting the job. On your papers, you see that your job title is “beginner” or “entry-level content writer”. Since you don’t have any prior experience in working as a writer, you start off as a beginner. This type of scenario is very common in most workplaces that you might apply to – this is especially true when it comes to IT-based job positions. These different sub-titles carry different benefits (i.e. you get a different app developer salary with each title), but they also represent different workloads and responsibilities. In total, there are three main types of how people classify app developers – beginner (entry-level), junior and senior. Let’s go over each one of them separately. This way, you’ll be able to better understand what each of these titles brings to the table. Beginner app developers are people who have just started out in the field of mobile application development. They might have heard about the awesome Android developer salary or the iOS developer salary, or might simply have a thing for app development in general. Whatever the case might be, these people are seen as complete beginners with a very limited pool of information and (most of the time) no prior experience with working in a company. Beginner app developers are usually tasked with some small assignments that would help the employer determine the person’s skill level and find a suitable place for him or her in the company more quickly. In some cases, the company might even offer the beginner developer a formal training opportunity. Entry-level app developers have a set timeframe (usually it’s three months, but it can vary from company to company) in which he or she has to prove to their employers that they are suitable for the job. This could happen sooner (in rare cases – later) – it all depends on the individual situation. Entry-level salaries are rarely something “to dream for”. However, you should keep one thing in mind – a beginner mobile app developer salary represents the title. If you’re a beginner, you should concentrate on learning and getting better at what you do in the shortest amount of time possible – the application developer salary will follow. Junior app developers are seen as the people who have already put in some time and research into their area of expertise. They might be university graduates who have already worked on a couple of projects, or simply freelancers that want to try themselves out in a company working environment. Junior developers are usually seen as quick learners – since they’ve already got the skill foundations for their job, all that’s left to learn to start working successfully is the etiquette and style of the brand that they’ve come to work for. There’s still a ton of information left to take in, but employers usually do trust junior developers with more important tasks much quicker than, let’s say, beginner ones. Salary-vise, you would think that the junior mobile app developer salary perfectly represents the average application developer salary, but that’s not the case. I will tell you why that is a bit later on in the article – for now, just keep in mind that there are many different variables that influence the junior iOS developer salary (or the Android developer salary). Finally, we have the senior application devs – people who have been in the game for the bigger parts of their lives. The title senior is somewhat self-explanatory – these developers have earned their reputations by both doing what they do for a long period of time, and doing it well. They are often tasked with some of the highest priority and responsibility tasks in the company. And rightfully so! Senior developers tend to acquire this title by sticking with one single company for an extended amount of time, and growing together with their other team members. They usually know the company and the app(s) that they’re working on through and through, which allows them to work fast and in an efficient manner. Furthermore, given the fact that senior developers are as knowledgeable about the company as they are, these people are often tasked with newbie supervision. This is very common in most areas of work – senior members of the team teach and mentor newcomers so that they would learn the needed skills as soon as possible. The senior app developer salary is the highest amount of money that a person can get paid for working in the app development field. This is, of course, excluding any and all personal projects that the person might take on. App Developer Salary – How Much Do They Get Paid? With all of the above information out of the way, we can finally get down to talking numbers. Before we go ahead and look over the entry-level Android developer salary (or iOS developer salary – they don’t differ all that much), there are a couple of things you should keep in mind. First of all, all of the numbers provided in this article are just estimations. 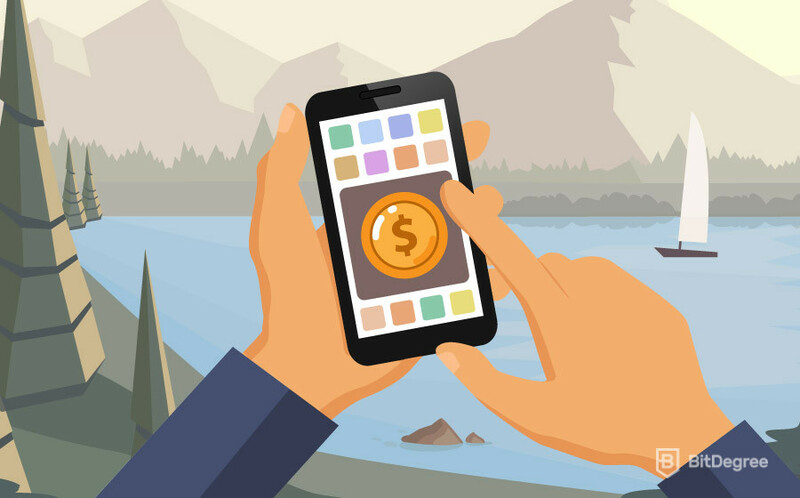 The actual salary that you could expect as an app developer varies and depends on your geographical location, skill level, the company that you want to work in, and other variables. Also, I will be comparing the different salaries with the average US monthly salary (which is around $3700 USD as of writing this article). As I’ve mentioned a bit earlier on, the beginner app developer salary might not be as impressive as many people put it out to be. Beginner developers have to concentrate on learning and improving their skills. This leads to them doing less actual work, which in turn provides a smaller salary. But enough with the chit-chat – let’s talk numbers. Payscale.com estimates that the average beginner app developer salary should be somewhere in the range of $61,700 USD per year ($5140 USD per month). Given all of the variables mentioned above, this turns out to be a pretty good salary! 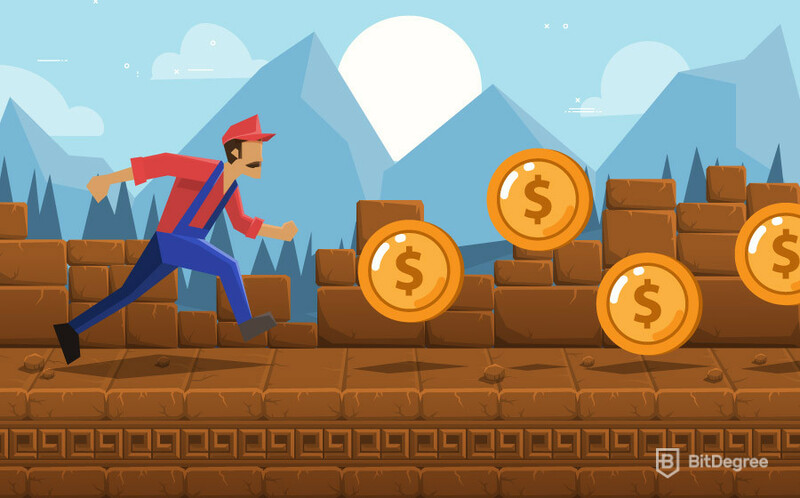 One possible reason for why the entry-level salary isn’t all that bad is because app development requires a lot of skill and time invested in the topic. This means that even beginner app developers have dedicated a lot of time to perfect their skills and knowledge, be it in a university or in any way else. And, apparently, those skills show! Junior app developers are a tough group to analyze. This is mostly due to the fact that it’s a very wide group of people possessing very different skill levels (some could be closer to the beginner group, others – to the senior) and who also work in many different companies. This means that, most probably, these people can expect very different salaries. 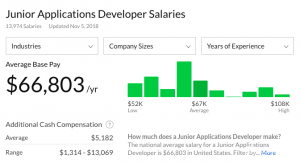 However, Glassdoor.com does have an estimate of a junior developer salary, so let’s take a look. It is estimated that junior app developers can expect to make around $66,800 USD annually, or $5570 USD every single month. Given that this is a very small jump from the entry-level app developer salary, it is probably safe to say that currently, the market has younger, less experienced junior app developers than senior ones. Depending on the day, these numbers might change drastically, so keep that in mind! If you’ve ever been in a discussion where someone would mention the fact of “just how much money app developers make”, the senior app developer salary is probably the thing that they were referring to. Senior devs, being the most experienced and proficient of the three groups, earn the most amount of money for their work. Their salaries don’t just “sound good”, however. Senior developers get paid for their expertise and their work – more often than not, they have more than enough of the latter one. 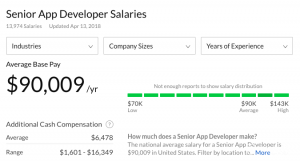 GlassDoor states that a senior app developer salary should range somewhere around the $90,000 USD mark (that’s $7500 USD every single month). Even though it’s not one of the biggest salaries out there (for example, game developers make much more money – however, they also have more requirements), it’s still pretty impressive. Given the fact that many senior app developers eventually decide to work on their own projects as a side thing, this would just add up to their profit acquisition list. So – we have reached the very end of this app developer salary article. As you’ve probably noticed, it isn’t all that easy to become a proficient and reputable app developer. Such a task requires a lot of work and time spent learning and perfecting your skills – something that not every person is set on doing. However, if you’re currently learning app development, and was contemplating quitting it altogether, I hope that this article has brought some of the motivation to keep on learning back within you. Whether you decide to follow the path of app development or you’re simply interested in the different salaries that app developers make, hopefully, you found this tutorial useful and interesting! Whatever you choose to do, I wish you the best of luck!